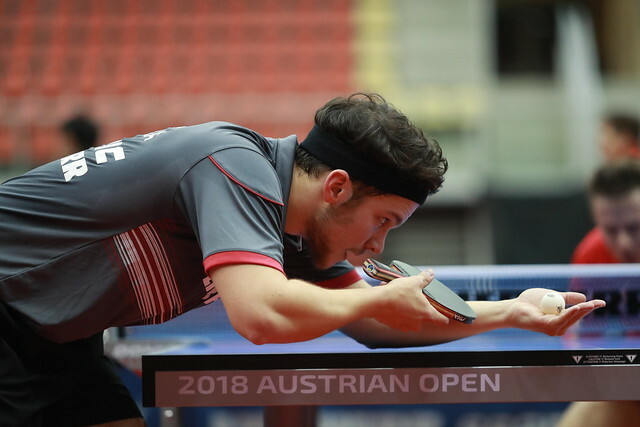 Following on from an epic start to the Seamaster 2018 ITTF World Tour Platinum Liebherr Austrian Open in Linz, Day Two is packed with even more exciting fixtures to look forward to including two fascinating encounters between young talent and experienced heads. Take a look at some of the standout contests lined-up for Friday 9th November. Separated by a 14-year age gap, we have a battle of generations set to unfold in the Men’s Singles competition as Japan’s Tomokazu Harimoto, 15, and Jun Mizutani, 29, do battle for a place in the last eight. The two have only met on one previous occasion, at the Liebherr 2017 World Championships in the German city of Düsseldorf – teenage ace Tomokazu Harimoto pulled off the victory on that day but will he have the upper hand in Linz? What a year it has been for Brazil’s Hugo Calderano who currently sits at a career-high ranking of ninth in the world and 2018 has also proved most profitable for Jang Woojin with the Korean player making World Tour history earlier in the year by claiming three gold medals at the Seamaster 2018 Platinum Shinhan Korea Open. In Linz the two will meet face-to-face in the Round of 16. Producing some of the best table tennis of his career so far in Linz, Sathiyan Gnanasekaran will be hoping for yet another impressive showing when he meets second seed Xu Xin at the foot of the draw while Chinese qualifier Zheng Peifeng has the honour of facing no.3 seed Timo Boll. Last year at the ITTF World Tour event held in the Chinese city of Shenzhen, Sun Yingsha put in an excellent display to finish in the silver medal position behind Ding Ning. On Day Two in Linz, Sun Yingsha and Ding Ning meet for just the second time on the international stage in a must watch encounter – can the 18-year-old qualifier achieve another milestone victory by upsetting the World champion? For the first time at senior level China’s Wang Manyu, 19, and Japan’s Miu Hirano, 18, take to the table in a eye-watering head-to-head contest with a spot in the quarter-finals up for grabs. Champion on Austrian soil last year, Wang Manyu will be keen to hold onto her title for as long as possible but Miu Hirano is a fine young player herself and is expected to make life difficult for the no.6 seed. Elsewhere, Chinese Taipei’s Cheng I-Ching will be aiming to claim just her second win against Singapore’s Feng Tianwei at an ITTF World Tour event, Chen Meng and Chen Xingtong meet in an all-China affair and Seamaster 2018 Swedish Open gold medallist Mima Ito takes on Doo Hoi Kem. The three doubles events will also resume on Day Two with quarter-finals and semi-finals fixtures.